Warts are the cutaneous manifestations of human papillomavirus (HPV) and may exist in different forms depending on the virus type and the epithelial surface involved. The papillomaviruses comprise a large family of small (50–55 nm diameter), double-stranded DNA viruses found in humans and many other species. The treatment of warts can be broadly classified into destructive, antimitotic, virucidal, immunotherapy, combination therapies, and some folk and alternative therapies which have recently become popular again. The destructive therapies include surgical removal by curettage and cautery, chemical cautery (silver nitrate, trichloroacetic acid, and salicylic acid), cantharidin, cryotherapy, electrocautery, radiocautery ablation, infrared coagulation, and photodynamic therapy and lasers. The other therapies available are intralesional bleomycin, retinoids, podophyllin and podophyllotoxin, glutaraldehyde, formaldehyde, formic acid, antiviral drugs, oral zinc sulfate, and contact sensitizers such as dinitrochlorobenzene, diphencyprone, and squaric acid dibutyl ester, intralesional injection of interferon or mumps/candida antigen, 5-fluorouracil, cimetidine, levamisole, imiquimod, and Bacillus Calmette–Guérin vaccines that are included in the other. Electrocautery is a form of electrosurgery that utilizes galvanic or direct current for generating heat. Although rarely used nowadays in the developed nations, it is still widely used in the developing countries and is considered more effective for treating thicker lesions with an overall success rate of 56%–80%. Cryotherapy is that branch of therapeutics in which local freezing is used for the controlled destruction or removal of living tissues. The most commonly used cryogen is liquid nitrogen with a temperature of −196°C. The effect on wart clearance is by necrotic destruction of HPV-infected keratinocytes or by inducing local inflammation that triggers an effective cell-mediated response, and the cure rate varies from 44% to 47%. Unfortunately, even with years of medical literature on this subject, high-quality level I evidence for the efficacy of almost all treatments is nonexistent. Hence, we conducted randomized comparative trial of radiofrequency ablation, electrodesiccation, and cryosurgery in the treatment of cutaneous warts. The aim of the study was to compare the efficacy and adverse effect of radiofrequency ablation, electrodesiccation, and cryosurgery in the treatment of cutaneous warts. 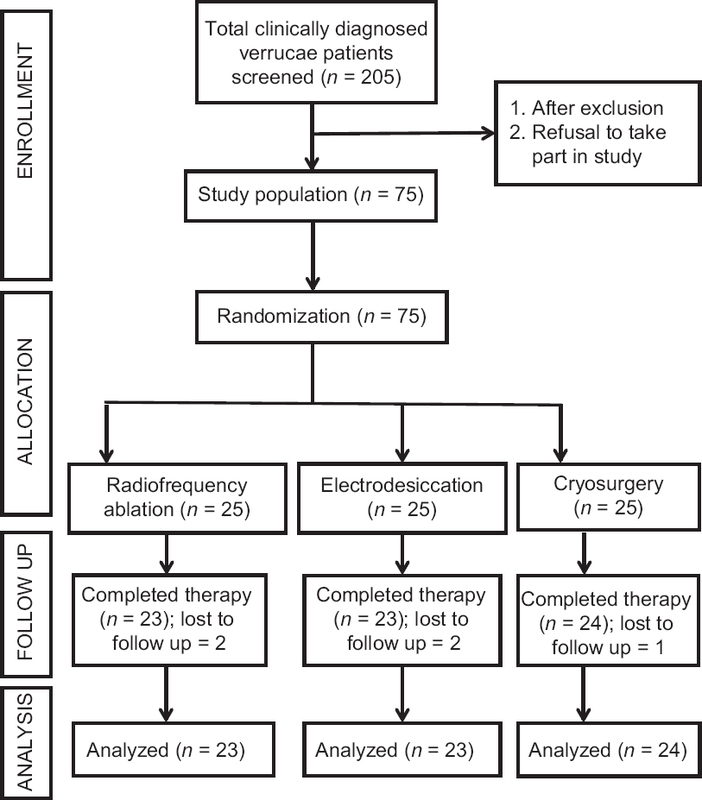 A total of 75 patients were enrolled in the randomized controlled trial and divided into three groups of radiofrequency ablation, electrodesiccation, and cryosurgery. Inclusion criteria were cases of common and plane warts with the size of ≥0.25 cm2 in patients with age >12 years. Exclusion criteria were warts involving palm and soles, mucosal surface and subungual area, warts with secondary infections or sign of inflammation, patient who received any form of therapy for warts within the past 1 month or systemic isotretinoin in the past 1 year, patients with cardiac pacemakers history of epilepsy or seizure, uncontrolled diabetes, hypertension, peripheral vascular disease, Hepatitis B, HIV infection or any immunosuppressive state, pregnancy, and lactation. The protocol was approved by the Institutional Ethics Committee. All patients were thoroughly explained in detail about the treatment procedure, course of the treatment, adverse effects, and possible outcome. An informed consent was taken from each patient before the procedure. A thorough cutaneous/systemic examination was carried out with laboratory investigations whenever necessary. Cryosurgery (Group C): Lesion(s) were treated by liquid nitrogen cryotherapy unit Dermaindia with open spray method. Spray tips with varying-sized apertures as per the size of the verruca was attached to the unit, emitting a stream of liquid nitrogen toward the lesion from a distance of 1–2 cm. The time of spray was directly proportional to the thickness of the lesion. The procedure was confirmed when wart has a 2 mm white halo around it. Freeze-thaw cycle was repeated according to the thickness of the lesion. The assessment was based on the reduction of the total surface area of the reference lesion(s), pigmentation, scarring, pain over the site, secondary infection, reappearance of skin markings, or dermatoglyphics and patient's satisfaction. After maximum sitting of 4 weeks, the patients were followed up at 8th and 12th week for final assessment. 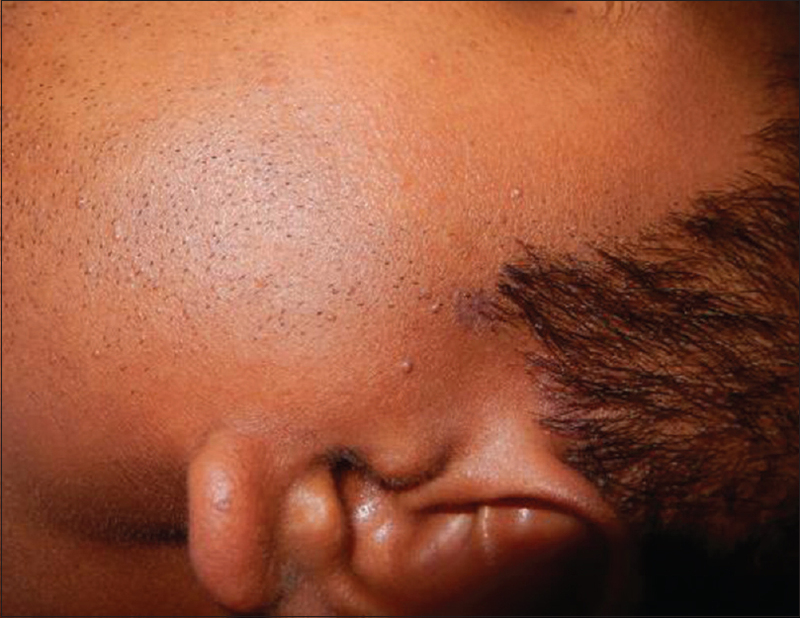 Complete resolution of the reference lesions, with or without the reappearance of the skin markings or dermatoglyphics at the final (12th) week of follow-up. In case, there was the persistence of the reference lesion(s), even after a maximum of four sessions, treatment failure was considered. Patients labeled as treatment failure were either given the same therapy or considered for other therapeutic modalities and progress was documented separately. In the event, if there was the reappearance of the reference lesion(s), either partially or completely, after their complete resolution, recurrence, or relapse was considered. In case, the patient was unable to come for more than 4 weeks' duration between two sittings he/she was excluded from the study. After completion of the study, the data were compiled, entered, filtered, and double checked in the Excel software program. Statistical analysis was performed by the SPSS version 17.0 (IBM Corp., NY). Continuous variables are presented as mean ± Standard deviation, and categorical variables were presented as absolute numbers and percentage. One-way analysis of variance was used to evaluate the significance of the differences in continuous variables. Categorical variables were analyzed using the Chi-square test. For all statistical tests, a P < 0.05 was considered as statistically significant difference. A total of 70 patients completed the study as five patients were lost to follow-up. The detailed follow-up is shown as a flowchart [Figure 1]. A total of 75 patients (male: 57 and female: 18) with a mean age of 33.83 ± 13.63 years (range 13–62 years) were enrolled in this study. The duration of the disease varied from 1 to 48 months. The demographic characteristics in three groups were comparable. Of 75, 62 (82%) patients had a common wart, followed by plane wart in 13 (17%) patients. In 40 (54%) patients, the surface area occupied by the reference lesions ranged from 0.25–0.50 cm2 followed by 26 (35%) and 1 (1%) patients with surface area between 0.51 and 5.0 cm2 and 5.01–10.0, respectively. Seven (9%) patients had wart area covering both 0.25–0.50 and 5.01–10.0 cm2. Of the total 75 included, 70 completed the study and remaining five patients were lost to follow-up. In Group A, 22/23 (95%) patients showed complete clearance at the 12th week as compared to 17/23 (73%) patients in Group B and 14/24 (58%) patients in Group C. This was statistically significant (P ≤ 0.001) [Figure 2], [Figure 3], [Figure 4], [Figure 5], [Figure 6]. In patients with verruca vulgaris, the best cure rate was seen in the radiofrequency group with 87% (20/23). The other two groups (electrodesiccation and cryosurgery) had lesser cure rates, 63% (12/19) and 45% (9/20), respectively (P = 0.053). For plane warts, radiofrequency and electrodesiccation and cryosurgery had similar cure rates of 100% [Table 1]. At the 12th week, 34/70 (48%) patients were very much satisfied and thought that the results of the procedure were excellent. In Group A, 21/23 (91%) thought that the results were excellent and remaining 2/23 (8%) said that it was acceptable, whereas in Group B, 8/23 (34%) said that results were excellent, 8/23 (34%) said they were acceptable, and 7/23 (34%) not acceptable. Least satisfaction of the patients was seen with Group C with 5/24 (20%) patients saying the results were excellent, 7/24 (29%) said that it was acceptable and 12/24 patient (50%) was not satisfied (P = 0.001). At the 12th week, 28/70 (40%) patients had a complete reappearance of skin marking or dermatoglyphics. Maximum number of these were seen in Group A 15/23 (65%) followed by 7/23 (30%) in Group B and least in Group C with 6/24 (25%) patients. Of the 70 patients, 29 (41%) patients had a recurrence at the end of 12 weeks. The overall recurrence rate for the radiofrequency group was 9% (5/23), for electrodesiccation group 41% (10/23), and for cryosurgery group only 58% (14/24). Thus, the recurrence was very less in the radiofrequency group as compared to the other two groups, but this was not statistically significant. Pain and secondary infection were minor adverse effects seen in 14% (10/70) and 8% (6/70) patients, respectively. Of the 70 patients, 41 (58%) showed pigmentary changes at the last follow-up (12th week). Nineteen (46%) patients were in cryosurgery group, 16 (39%) in electrodesiccation and 6 (14%) in radiofrequency group. Hypopigmentation was the predominant pigmentary change with 18 patients followed by hyperpigmentation in 15 patients and depigmentation in eight patients. Hypopigmentation was present in 10 (55%) patients treated with cryosurgery followed by 5 (27%) patients in electrodesiccation group and 3 (16%) in radiofrequency group. At the end of the 12th week, 24/70 (34%) patients had scarring. Sixteen (66%) of these were of atrophic type followed by flat type in 8 (33%) patients followed by hypertrophic type observed in 6 (25%) patients. The hypertrophic type was only seen with electrodesiccation and flat type in 4 (50%), 3 (37%), and 1 (12%) in radiofrequency, cryosurgery, and electrodesiccation, respectively. 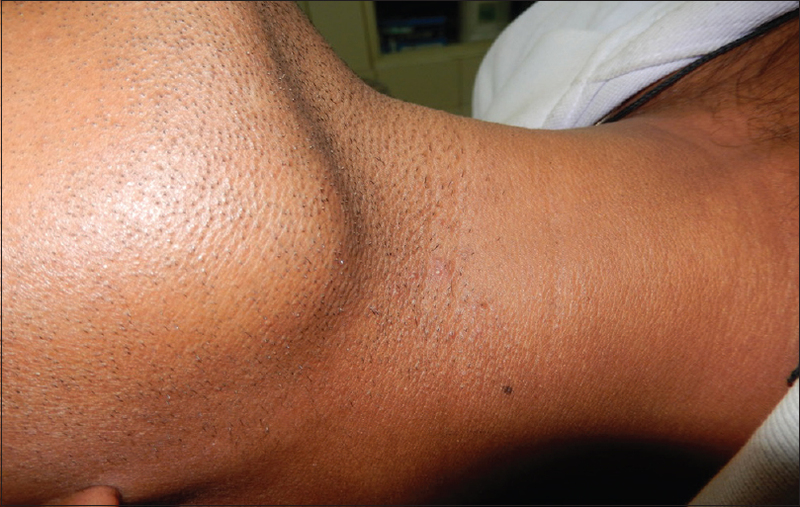 Atrophic type was seen in 12 (75%), 3 (18%), and 1 (6%) patients in cryosurgery, radiofrequency, and electrodesiccation, respectively [Figure 7]. For the treatment of warts, destructive modalities are said to be more efficacious in comparison to other forms of treatment. Although the modalities of the treatment used in the present study are used regularly, the evidence of efficacy is still lacking. The comparison of different treatments is often difficult to assess, as the exact techniques used for the treatment of the warts are not always described. 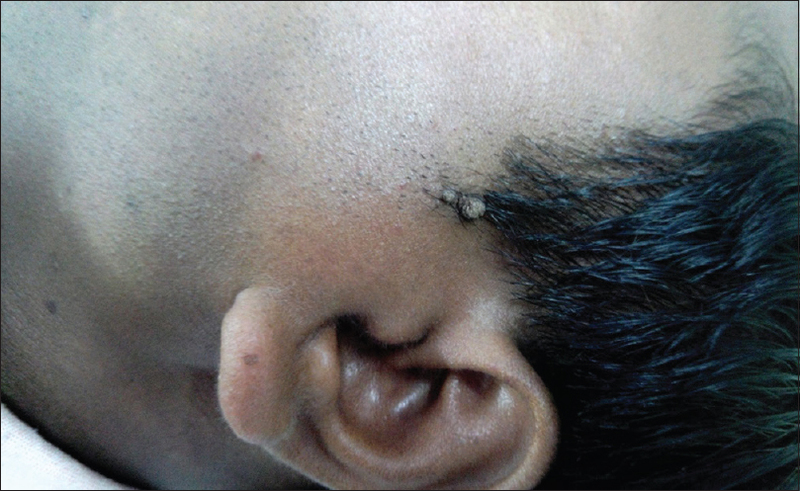 Radiofrequency ablation was done with radiosurgical apparatus Dermaindia in electrode cutting mode, and the power was adjusted according to type and size of the lesion. Electrodesiccation was done with the electrosurgical unit Dermaindia using straight electrode, and the power was adjusted according to the size and type of the lesion. Cryosurgery was done by liquid nitrogen cryotherapy unit Dermaindia with open spray method and freeze-thaw cycle was repeated according to thickness of the lesion. There is a lack of head-to-head comparative studies in the literature for the all the treatment modalities used in our study for the management of wart. Cochrane systemic review of 60 trials on warts showed that 46 (77%) were classified as low quality, heterogeneity between trials was high and analysis was often inappropriate or misleading. In the present study, higher cure rate was seen with radiofrequency group as compared to the other two modalities, and this was statistically significant (P = 0.001). This may be explained as radiofrequency ablation allows cutting without pressure, and therefore there is little tissue damage and minimal scarring. Healing is by granulation, with a soft and supple scar. An earlier study in 2010 demonstrated 86% (25/29) cure rate in 29 common warts treated with only two sittings with radiofrequency ablation. A study in 2013 demonstrated that 96% (24/25) of the palmoplantar warts got cured with radiofrequency which was comparable to our study. Our study showed better cure rate than the above-mentioned study probably because most of the previous studies had been done in recalcitrant or persistent warts and also on plantar verrucae, which is known to be resistant to treatment. A study by Kaçar et al. showed a cure rate of 41.7% (5/12) with cryotherapy which was lower than our study. In case of plane warts, 80% showed a moderate response and 20% a poor response to electrosurgery. One study with a population of 194 warts found no statistically significant difference among cure rates between pulsed dye laser (66%) compared to conventional cryotherapy or cantharidin therapy (70%). A study by Heaumebh showed electrocautery and curettage with a cure rate of 80%–90%. A further study noted a clearance rates of 71% and 55% for electrodesiccation and cryotherapy, respectively, which was similar to our study. In the present study, 88% of patients of verruca vulgaris achieved complete cure and among these, the best cure rate was seen with radiofrequency modality in 87% patients. 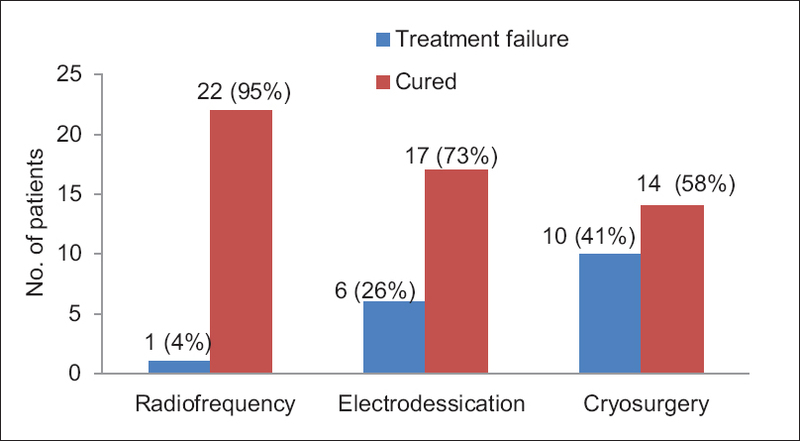 The electrodesiccation and cryosurgery modalities had a complete cure in 63% and 45% patients, respectively. Radiofrequency showed higher cure rate for verruca vulgaris as compared to electrodesiccation and cryosurgery, but this was not statistically significant. All three modalities showed 100% response in cases of plane wart probably because these warts are more superficial. Dogra et al. also reported 100% cure rate of plane warts with electrosurgery. At the 12th week, 48% of patients in all three groups were very much satisfied with the treatment in the present study. The radiofrequency group had maximum satisfaction in 21/23 patients followed by electrodesiccation group 34% patients and least in the cryosurgery group in 20% patients. This difference was statically significant (P = 0.001). The lesser satisfaction in electrodesiccation and cryosurgery group as compared to the radiofrequency group was mainly because of a higher incidence of recurrence, scarring, and pigmentation associated with the latter two groups. In a retrospective study of 200 patients with verruca vulgaris treated with the CO2 laser, 71.7% of the patients were happy with the treatment. This was much higher to the results in our study. This might be due to the use of different treatment modalities. At the 12th week, the complete reappearance of skin marking or dermatoglyphics was maximum in radiofrequency group 65% followed by 30% in electrodesiccation group and least in cryosurgery group with 25% patients. Recurrence was seen least in radiofrequency modalities and maximum in cryosurgery. Of 70 patients, 41% of patients had a recurrence. The overall recurrence rate for radiofrequency group was 9%, for electrodesiccation group 41%, and for cryosurgery group only 58%. The recurrences were maximum in cryosurgery. Cryosurgery forms a white halo in 5–30 s over and beyond the lesion which is considered as the endpoint of therapy. There could be a variable response to the therapy in different areas of the lesion which is difficult to assess clinically. Moreover, presuming that there will be more side effects, the procedure is not continued beyond the halo formation. Hence, some of the virus may remain viable in the lesion. However, in radiofrequency ablation/electrodesiccation pinpoint destruction of tissue takes place that can be assessed clinically and the procedure can be repeated in the same sitting after pairing which increases the destruction of the virus in the lesion. With respect to adverse effect, pigmentary changes were seen in all the modalities. At 12th week, radiofrequency had the least pigmentary changes (26%) than other two modalities – electrodesiccation (69%) and cryosurgery (79%) (P = 0.001). Hypopigmentation was seen in maximum cases followed by hyperpigmentation and depigmentation. A study by Dogra et al. showed electrocautery was associated with pigmentary changes, in which hypopigmentation was seen in 12% patients whereas hyperpigmentation was seen in 8% patients. At the end of 12th week, 34% of patients had scarring. Scarring has been reported previously in up to 30% of patients which was similar to our study. Most of the destructive modalities are effective in treating but newer treatment option should be tried if the lesion shows no response to particular treatment in 4 weeks. Radiofrequency was a better modality, cost-effective, and easy to handle machine for the treatment of cutaneous warts as compared to other two modalities in the present study. This should ideally be present in every dermatology operation theater. There should be a more comparative trial with a large sample size to establish the efficacy of particular modality. Lowy DR, Androphy EJ. Warts. In: Freedberg IM, Eisen AZ, Wolff K, Austen KF, Goldsmith LA, Katz SI, editors. Fitzpatrick's Dermatology in General Medicine. 6th ed., Vol. 2. New York: McGrawh-Hill Medical Publishing Division; 2003. p. 2119-31. Wyre HW Jr., Stolar R. Extirpation of warts by a loop electrode and cutting current. J Dermatol Surg Oncol 1977;3:520-2. Ferenczy A, Bergeron C, Richart RM. Human papillomavirus DNA in fomites on objects used for the management of patients with genital human papillomavirus infections. Obstet Gynecol 1989;74:950-4. Dogra A, Gupta SK, Bansal A. Comparative efficacy of topical 5% FU with electrosurgey in treatment of warts. Indian J Dermatol 2006;51:108-10. Kuykendall-Ivy TD, Johnson SM. Evidence-based review of management of nongenital cutaneous warts. Cutis 2003;71:213-22. Gibbs S, Harvey I, Sterling J, Stark R. Local treatments for cutaneous warts: Systematic review. BMJ 2002;325:461. Gibbs S, Harvey I. Topical treatments for cutaneous warts. Cochrane Database Syst Rev 2006;(3):CD001781. Brown JS. Radiosurgery. In: Minor Surgery a Text and Atlas. 3rd ed. London: Chapman and Hall; 1997. p. 324-5. Huo W, Gao XH, Sun XP, Qi RQ, Hong Y, Mchepange UO, et al. Local hyperthermia at 44 degrees C for the treatment of plantar warts: A randomized, patient-blinded, placebo-controlled trial. J Infect Dis 2010;201:1169-72. Khandelwal K, Bumb RA, Mehta RD, Ghiya BC, Satoskar AR. Long-term efficacy of radiofrequency ablation in treatment of common and palmo-plantar warts. Australas J Dermatol 2013;54:307-9. Kaçar N, Taşlı L, Korkmaz S, Ergin S, Erdoğan BŞ. Cantharidin-podophylotoxin-salicylic acid versus cryotherapy in the treatment of plantar warts: A randomized prospective study. J Eur Acad Dermatol Venereol 2012;26:889-93. Robson KJ, Cunningham NM, Kruzan KL, Patel DS, Kreiter CD, O'Donnell MJ, et al. Pulsed-dye laser versus conventional therapy in the treatment of warts: A prospective randomized trial. J Am Acad Dermatol 2000;43:275-80. Heaumebh DU. Warts in general practice. J Coll Gen Pract 1964;7:87-93. Stone KM, Becker TM, Hadgu A, Kraus SJ. Treatment of external genital warts: A randomised clinical trial comparing podophyllin, cryotherapy, and electrodesiccation. Genitourin Med 1990;66:16-9. Sloan K, Haberman H, Lynde CW. Carbon dioxide laser-treatment of resistant verrucae vulgaris: Retrospective analysis. J Cutan Med Surg 1998;2:142-5. Savant SS, editor. Cryosurgery. In: Textbook of Dermatosurgery and Cosmeteology. 2nd ed. Mumbai: ASCAD; 2005. p. 117-35. Lipke MM. An armamentarium of wart treatments. Clin Med Res 2006;4:273-93.